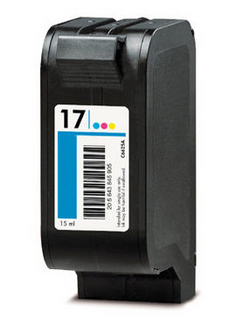 NOTE: “Empty” and “Low Ink” alerts are COMPLETELY NORMAL for HP 17 ink cartridges which have been refilled! While at first this may be an unusual workflow, it does allow print operations to proceed. However, it is possible to reset the ink level monitor – refer to menu selections above for reset instructions. – Cartridge Diagnostics. The cartridge’s electrical health can be verified by running the ‘Tap 41’ diagnostics or printer’s self test print at the printer’s control panel (NOTE: may not be available on all printer models). Press the RESUME button four times. NOTE: There are no internal clean or diagnostic tests for the HP Deskjet 820cse and 820cxi printers. Press and hold the RESUME button until the printer starts printing. NOTE: There is no internal clean test for the HP Deskjet 810c, 830c, 880c, and 895c series printers. Press the X (Cancel) button eight times. Step 3: Run a self-test and/or re-set the printer. Refer to Printer Model page (if available) or HP Printer Diagnostics page from the selections above or refer to Advanced Diagnostics below.